OWNER WANTS TO SELL !! Business obligations keep him from using his yacht. This high quality Maiora Motor Yacht - cruising in the Caribbean between Barbados - Grenada and Trinidad - is ready for her new owner. Just completedSurvey / Valuation inApril 2018.Newer Onan17.5 kw Generator. Newer 10' AB dinghy with Honda 10 HP 4stroke. Newer Bimini within last 4 years. New Life Rafts 2014 New EPIRB. New teak deck on swim platform. Atlas convertor adapts to both 110 and 220 allowing travel anywhere in the world. New carpet and drapes installed after photos were taken. "Clear ice" maker - never run out of ice again! Upgraded fire extinguishers througout. Custom rub rails - a real plus when docking ‘side to’. Custom sink / bar area on flybridge. Low engine hours (1,800hrs +/-) Three ensuite staterooms (plus separate crew quarters for two). Master and VIP staterooms are almost identical, full beam, walk around king bedded rooms. She is ideal for two couples wanting equal accommodation. The twin stateroom can easily be converted to a King stateroom for a third couple or great for kids as two twins. 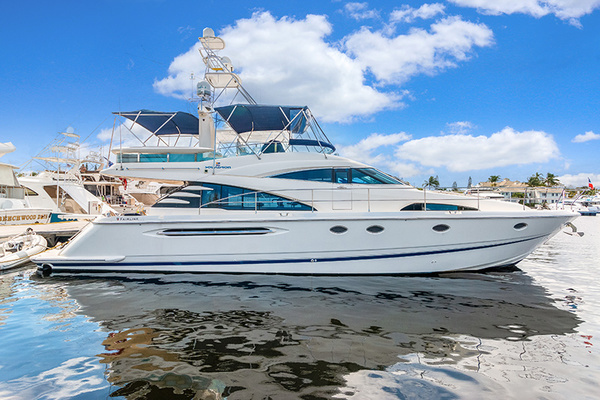 This yacht features the garage on the bow for safe and out of the way stowage of the tender, leaving the flybridge open for sunning and relaxing, even when underway. She cruises easily at about 18 knots with top speed of 23 knots, even when waves are kicking up a bit. Custom Aft Deck staircase to flybridge is a fabulous addition designed, built and installed at the Maiora factory. Great Family or Charter yacht! EUROPEAN CLIENTS - come enjoy the sunny Caribbean this winter on this beautiful yacht - then take her back to Europe in the summer!! Convertor plugs in to both electrical currents. United Yacht Sales New Jersey would love to guide you through a personal showing of this 70' Maiora 20m 2001. This yacht for sale is located in Cruising the Caribbean Grenada and priced at $599,000. For a showing please contact us by filling out the form on this page and we will get back to you shortly!